If you're serious about making your own music, ACID Music Studio software is the perfect tool for original song creation, multitrack audio and MIDI recording, and studio-quality mixing, and effects processing. Share your songs any way you want — burn your own CDs, upload to the web, prepare audio for podcasts, or export to your MP3 player. Withbuilt-in tutorials to guide you, you'll be composing, mixing, and mastering like a pro in no time. Record vocals, guitars, keyboards, and other instruments with ACID Music Studio software. It's easy — simply plug your microphone or instrument into your PC sound card and click Record to capture audio and MIDI. Burn your own music CDs, save the songs you create to popular formats for uploading to websites such as ACIDplanet.com, prepare audio for podcasts, or convert songs to MP3 format for playback on your portable music player. Even if you've never written a song or played an instrument, you can use ACID® Music Studio software to create original music, produce DJ-style remixes, add soundtracks to videos, and burn professional-quality CDs. Professional mixing tools give you precise control over volume and panning, effects processing, audio routing, and final output. Customize your songs using professional-quality audio effects including EQ, reverb, delay, chorus, flange, phase, distortion, echo, and more. Use VST and DirectX audio effects, and VST instruments. Add pan and volume envelopes, reverse audio, and change the pitch and tempo of your mix in real time. Use ACID Music Studio Software for complete MIDI editing and sequencing. Record and edit MIDI note and controller data on the timeline, and assign to any MIDI instrument. 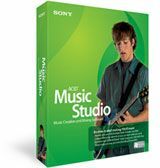 ACID Music Studio software supports VSTi and includes over 1,000 MIDI files and 90 instruments for song creation. Create your own CDs in minutes. Disc-at-once CD layout and burning is fully integrated into the software so you can conveniently create your music and produce professional-sounding CDs all within one application. Powerful encoding functionality lets you save your songs to popular streaming formats for uploading to the web, or export them to portable music devices.